Like it or not, you and your publisher enter into a kind of marriage, the kind of marriage where their name attaches itself to you. Think about that. An important facet of the relationship is the reputation your new partner has in the industry. If their stature is questionable, it may be difficult to find reviewers, distributors and even readers. It’s called guilt by association. Therefore, your first order of business is to do research. One way to establish a publisher’s reputation is to visit your local bookstore and ask the owner if they are known. If so, what are they like to do business with? Using the Internet to investigate the company’s name and their officers is also an advisable avenue. Still another approach is to post questions within various writing groups. By far, writing groups can be your best source of information. Be direct and ask the publisher how many books they put into print last year. How many to date? Are they are willing to provide you with a list of their authors for references? A useful gauge in picking a publisher is knowing how well the company treats its authors. Find out how many books the average author has with this house – you want to know if authors stay for more than one book. Something else to consider is the book itself. Just what is it this company is going to produce for you? A hardback? Trade paperback? Paperback? E-book? Ask them what the size is going to be, along with an estimated page count. What is the proposed list price? What you need to establish is how well your book is going to stand up to the competition – other books sitting on the shelf in your genre. If similar titles are selling in the $13 -$15 range, and the publisher wants to list yours at $22, your book may be tough to sell. Price does matter. Find out what services the publisher provides. Editing? Copy Editing? Format? Cover Design? Copyrights? How about help with the permissions for songs or quotes? Are there any fees attached? Will the publisher help you locate a well-known author or celebrity to write a forward? What about that all-important back cover blurb – any help there? Is the editing accomplished electronically or is it sent snail mail? How many edits should you expect? How long does the process usually take? Will the product have an ISBN? How about a bar code? Will they provide the author with any free copies? How many? Is this publisher willing to send you a sample of their current work? The sample should ultimately be a reflection of something you would be proud to put into public view. Read it, read it again and then have somebody else read it – like an attorney. The last thing you want to do is to sign away the rights to your manuscript without understanding every single detail. What are you getting out of the deal? Royalties? Movie rights? International rights? Anything? You need to know exactly how much you are going to get paid and when. Watch out for percentage contracts with variable rates. Does this publisher pay their authors? What is the average pay for an author? Are they willing to give you verification? When was the last time this company was audited? Is the company in good fiscal health? How long is the contract for? Six months? A year? Your next two books? Is the publisher asking for any money from you? Why? A reputable publisher pays you – not the other way around. How long do they plan on keeping your title in print? While many will produce, few will promote. Even an outstanding book will not sell unless it is correctly marketed. The major expense in publication lies not in book production, rather book promotion. Some publishers would like you to believe that once your book is in print, it will sell – but that isn’t the truth. A successful author will tell you that it takes a lot of hard work to get a new book into the public’s eye. If your publisher is unwilling to show to you a proven marketing strategy, look for another company. What you need to find out is how the publishers marketing system works – in other words, who is going to distribute your book? Ingrams? Baker & Taylor? A regional distributor? Will sales be restricted to giants like Amazon or Barnes & Noble? Does the publisher have adequate contacts with independents like BookSense? Grocery stores? Chain stores? Warehouse Stores? Are they willing to service the local stores in your area? What are the sales percentages for each distributor? This is extremely important. Some publishers will claim to list your book with many different distributors, but just how many are actually being sold? Listing isn’t selling. You may want to ask yourself how this company stays in business if it doesn’t actively promote and sell books. Ask what the terms of payment are for a given distributor. Most retailers are accustomed to an open account with books being taken on a returnable basis. Check to make sure that your publisher allows returns and doesn’t demand orders to be paid in advance. This type of business practice will get few, if any orders. How many books does the publisher plan on initially distributing? Don’t get tricked with some type of “Print on Demand” language – you need to know if your publisher will commit to running a thousand books or more at their expense, because “demand” is only created after a number of reputable people have read your work and then communicate to others in a positive manner. Your book should be circulated to reviewers, newspapers, bookstore owners, retailers, radio stations – even to your friends and family who will give you a tremendous boost through their contacts – months before it is ever “released.” This gives potential retailers a chance to preview the product and opt-in. So, another piece of valuable information is the number of copies the publisher plans on printing for advance review copies. 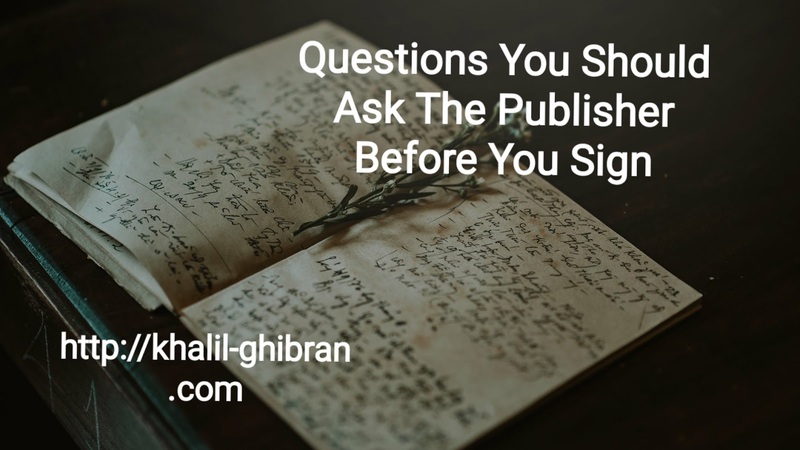 Ask if the ARC’s are going to be distributed in the form of a book or professional galley. If it is a galley, ask for a sample – again, it has to be something you’d be proud of. Who will be paying for these copies and the mailings? Will the publisher furnish a professional media kit? This is a regularly updated promotional tool used to highlight your interviews, signings, reviews, awards and appearances. If so, ask to see a sample. Do they provide posters? Shelf talkers? Bookmarks? What about a web site? Will the publisher provide you with this service or are you expected to furnish your own? Are authors given an in-house publicist? Who is it? What is their experience level? How many authors does the publicist work with at one time? Will your publicist set up a book tour? Are they going to pay for it? If so, ask where, when and how long you will be expected to be away from your family. How about the scheduling of radio and newspaper interviews? Will your book be introduced at tradeshows? Granted, if you are a first time author, you may not get everything that you want, but the company should still offer you fair compensation and a reasonable chance for success. The best advice that I can give to you is to keep your checkbook closed, be patient and do the homework. 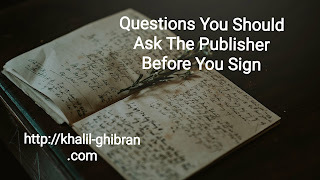 Don’t take the word of the publisher or agent at face value, instead, confirm their responses with others who have had past business dealings and then make sure everything is in writing. Keep in mind that web sites and promo literature are often clouded enough to the point of being untruthful. Protect your work, protect your dreams and keep trying.